Tuesday, March 28, 1865.Steamboat River Queen. Generals Grant and Sherman and Rear Admiral Porter ride out to River Queen in tugboat and have general conversation with President about military situation and strategy. Generals Meade, Ord, and Sheridan also present. William T. Sherman, Memoirs of General William T. Sherman, by Himself, 2 vols. 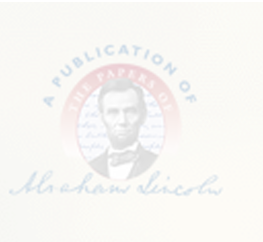 (Bloomington: Indiana University Press, 1957), 2:325-27; Daily National Republican (Washington, DC), 29 March 1865, 2d ed., 2:4; Evening Star (Washington, DC), 29 March 1865, 2d ed., 2:4. Writes Secretary of War Stanton: "After your explanation, I think it is little or no difference whether the Fort-Sumpter ceremony takes place on the 13th. or 14th. Gen. Sherman tells me he is well acquainted with James Yeatman, & that he thinks him almost the best man in the country for any thing he will undertake." Abraham Lincoln to Edwin M. Stanton, 28 March 1865, CW, 8:376. President Lincoln writes to Great Britain's Queen Victoria and acknowledges that foreign minister Lord Lyons resigned due to the "state of his health." Lincoln writes, "[Lyons] has, I do not doubt . . . assured your Majesty, of the invariable friendship of the United States, and of their cordial good wishes for the prosperity and happiness of your Majesty's Realm. I derive much satisfaction from the assurance contained in your letter, of the interest your Majesty takes in all that concerns the welfare and prosperity of the United States." Abraham Lincoln to Queen Victoria, 28 March 1865, CW, 10:284-85.